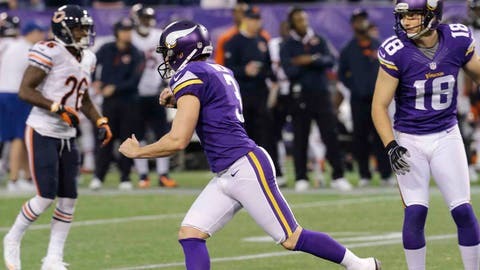 Minnesota Vikings kicker Blair Walsh (center) celebrates in front of teammate Jeff Locke (right) and Chicago Bears cornerback Tim Jennings after kicking a 34-yard field goal during overtime of an NFL football game on Sunday, Dec. 1, 2013, in Minneapolis. The Vikings won 23-20. "You’re at an all-time high because you think you’ve got a victory, and then you’re sitting there waiting for what the call is and you’re at an all-time low," Peterson said. "Ultimately we were able to give him another opportunity and he nailed it." "It’s been my mindset since I was young to be the best to ever play," Peterson said. "You’ve got to believe it in order to accomplish it." "It was one of the greatest days of my life, and I’m happy for my wife and my little boy," Gould said. "Sorry I couldn’t do it for my teammates like I did for my wife this morning." "We were definitely in range, and I didn’t want to at that point in time risk a possible penalty that would set us back, similar to what happened on the other side, or a fumble of some kind," Trestman said. "Something unique." "We’ve got to put up a win in the win column. . . . The standings don’t matter if you don’t win football games," said McCown, playing again for the injured Jay Cutler.